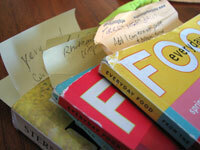 There's a better way to keep track of your favorite cookbook recipes. Cookbooker lets you catalogue, rate and review recipes from your favorite cookbooks, magazines and websites, then find out what other cooks think about them. We bring the power and usefulness of an online community to your kitchen. Cookbooker is a search engine for your bookshelf. Sign up now. The Web is a fantastic place for ratings, reviews and sharing opinions on everything, including recipes. But what about the millions of recipes locked up in cookbooks and food magazines? Until now they've been left out of the discussion. Add books, magazines, food blogs & websites to your online bookshelf. If other members own them you'll be able to see their ratings and recipe reviews right away. Add comments and suggestions, additions, substitutions and private notes. You'll be able to easily search them later. Find opinions about recipes you own but have never tried, and cookbooks you might like to buy. It costs nothing to join. You can search and browse without even becoming a member. Find out more about Cookbooker.